The Early Cretaceous rocks of the Wessex sub-basin exposed on the Isle of Wight consist of two Formations: the Vectis Formation and the older, thicker Wessex Formation. The youngest division of the Wealden, the Vectis Formation is split into three members, these being the Shepherds Chine Member, the Barnes High Sandstone Member and the Cowleaze Chine Member. The Vectis Formation was deposited in and around the margins of a shallow sub-tropical coastal lagoon with fluctuating salinity. The presence of desiccation cracks, as well as dinosaur footprints, suggests that the area was occasionally emerged (Radley et al., 1998). The thickest member of the Vectis Formation, the Shepherds Chine member consists of fine grained, laminated beds, showing deposition over a coastal region, with four shelly limestone beds. As the beds above this, the Lower Greensand, are marine sediments, this reflects a marine transgression over the Barremian and Aptian stages. Dinosaur footprints are found in this member about 30 metres from the base in the first limestone layer, and are usually attributed to 'theropods', although there are also some 'ornithopod' tracks (Radley et al., 1998). This is an upward-coarsening succession, consisting of lenticular and wavy bedded shelly and bioturbated calcite-cemented and ferruginous sandstones. 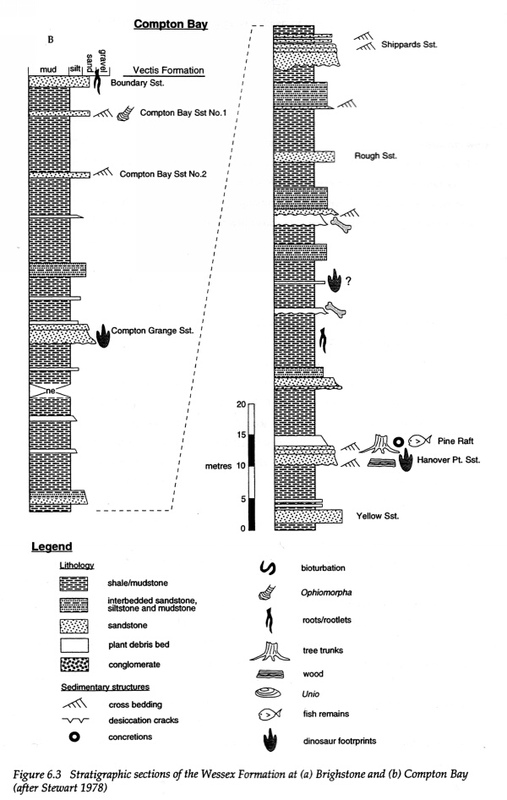 It is interpreted as a shallowing upward river mouth bar succession, with the higher cross-bedded units being deposited in a bar crest setting (Radley et al., 1998). In this bed, there are both rare 'theropod' and larger, more common 'Iguanodon' tracks known at Atherfield, from the top two metres. These are usually badly preserved and incomplete (Radley et al., 1998). About seven metres thick, this is a dark mudstone, with no visible laminations, containing a shelly fauna of ostracods and gastropods, including Viviparus. It was probably a shallow, subaqueous environment, a brackish lagoon (Insole et al., 1998). In this member, the footprints are found in a white sandstone bed at the base, known as the White Rock Sandstone (Radley et al., 1998). Grey-green mudstones containing vertebrate remains, lignite, pyrite and siderite created in stagnating shallow ponds, similar to today's billabongs, on the flood plain, which would act as sinks for the debris washed in during floods. Mottled mudstones, containing goethite and pseudo-anticlines, created by surface water gley soils. Red mudstones with pseudo-anticlines, haematite and carbonate nodules, the lithified remains of vertisols that are formed on elevated areas that flood only occasionally. 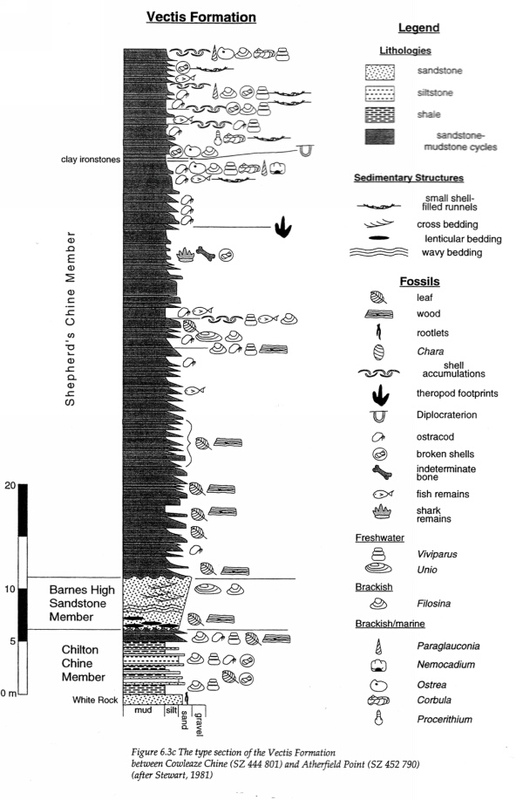 Most of these lithofacies imply the presence of palaeosols, although none have been found in their entirety in the Wessex Formation. The mottled and pseudo-anticlined mudstones are too thick to be natural palaeosols, as although compaction of vertisols after burial is minimal they are thicker than normal soil profiles, suggesting a gradual accumulation of sediment at frequent intervals (Wright et al., 2000). These lithofacies indicate a seasonal wetland, an environment common in modern tropical and sub-tropical river systems. Whereas a regular wetland in either permanently submerged to a shallow depth or the ground surface is at the waterline, a seasonal wetland has these features for a short period, and is dry for the rest of the time. There are many modern examples, for example the Pantanal of Brazil and the Varzea flooded forest of the Amazon Basin. These are what are known as riparian seasonal wetlands, associated with large rivers, influenced by heavy rainfall to create flood effects (Wright et al., 2000). These sudden influxes of water, and by association, sediment at seasonal intervals would account for the thick bedding of the palaeosols. However, the mottling and pseudo-anticlines implies that the flooding was frequent, quite possibly annually, with large quantities of suspended sediment. The mudstone facies show gradation, the green mudstones at the bottom, the mottled mudstones on slightly higher ground and the red mudstones are on the highest ground that is still effected by flooding but drains easier, allowing the formation of haematite, calcrete nodules (Wright et al., 2000), and mud-cracks, as in the Hypsilophodon beds at the top of the Wessex Formation. 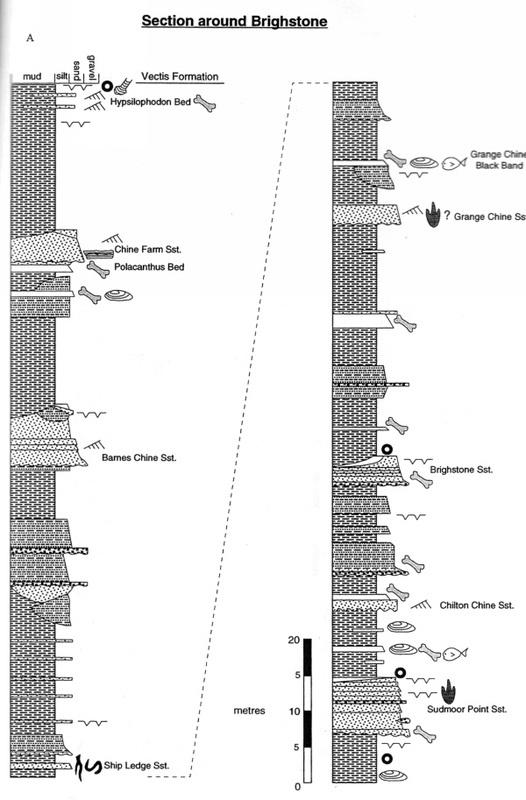 These lithologies imply a catena, a group of soils formed on similar parent materials in the same climate but being different due to drainage differences caused by topographic variation (Wright et al., 2000). Most of the dinosaurs are found in the grey clay plant debris beds, presumed to be the bottom of stagnant pools or the results of flash flooding. Either way, the bones were buried quickly in a reduced oxygen atmosphere, which may have lead to sulphate reduction taking place. This would then lead to fine scale pyrite production within the crystalline structure of the bone, causing the bones to appear black, although the refractory components of organic matrix of the bone may also be a factor (Martill, 2001). Dinosaur footprints occur in most of the sandstone beds, with 'Iguanodon' tracks being most common (Wright, 1996). The presence of these splay-crevasse arenaceous layers in otherwise argillaceous strata has been attributed to the bursting of levees (Wright et al., 2000). It has been suggested by some that they may be caused by short, regular, marine transgressions and regressions (Matteson, pers. comm. 2003), although this is not the most prevalent theory.